The European Space Agency's Euclid Mission will be launched in 2020. During its six-year mission, the Euclid satellite's cutting edge scientific payload will survey nearly 40% of the sky, providing scientists with an extraordinarily large amount of data that will impact many aspects of modern astronomy. The Euclid Mission's primary science goals are targeted towards understanding the Universe on its largest scales: how did the Universe evolve since the Big Bang, and what are the fundamental physical laws dictating this evolution? In particular, the main science goals focus on constraining the nature of two of the most puzzling quantities in our Universe: Dark Energy and Dark Matter. In order to do so, the Euclid Satellite will image billions of galaxies as well as measure tens of millions of spectra. Such a treasure trove of data will also be highly valuable for the wider astronomical community. 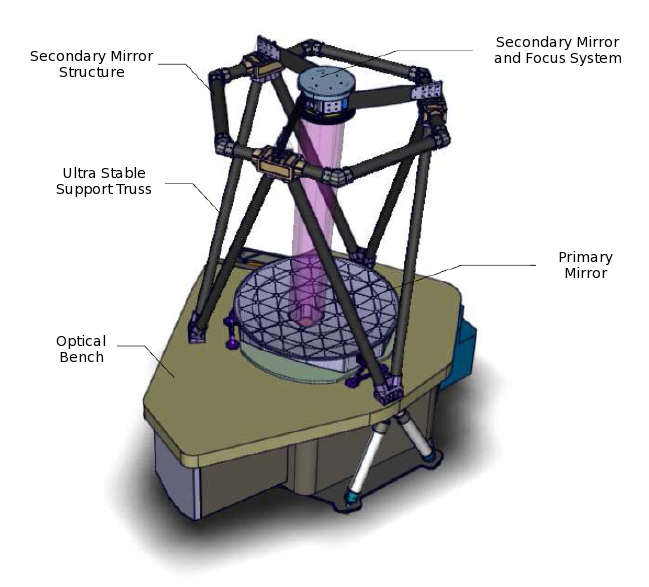 An early concept of the Euclid telescope (ESA/EC). The Euclid satellite is currently being designed within the framework of the European Space Agency's Cosmic Vision Framework. The Euclid satellite, and its launch, will be provided by the European Space Agency. The mission's cutting-edge scientific payload is being developed by a multi-national consortium of scientific institutes. The Euclid Scientific Consortium (EC) is led by Yannick Mellier (IAP, France) and is composed of over a 1,000 scientists and engineers from 14 nations. The Max Planck Institute for Astronomy (MPIA) plays a crucial role in this consortium. The MPIA currently has a six-person contribution to the Euclid Mission, four of them funded by the German Aerospace Center (DLR), and is led by Knud Jahnke.